The head of the Greek police was secretly recorded saying that asylum seekers who land in Greece must be made to reside in "unliveable" conditions before being "repatriated". The issue of migrants dying in the seas around Greece gained global attention in January, when a boat carrying asylum seekers from Afghanistan and Syria capsized in the Aegean while being towed by a Greek naval vessel. Twelve migrants drowned, and those who survived alleged that the Greek coastguard was attempting to tow them back towards Turkey instead of to a nearby Greek island, and that the naval officers purposefully allowed migrants to drown. The Greek navy denies the migrants' allegations, but the UN, the EU and Amnesty have released statements expressing deep concern about the incident. The following article on revelations regarding Greek police policy towards asylum seekers in Greece was originally published before the aforementioned incident, in the December 19, 2013 issue of Hot Doc magazine. 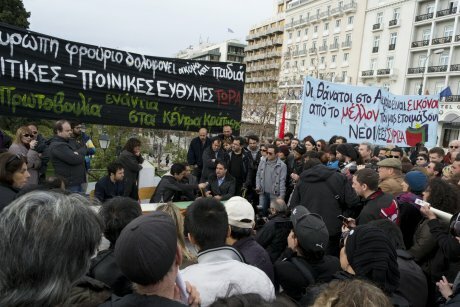 A protest in Athens to defened the rights of asylum seekers in Greece, organised after the Farmakonisi boat tragedy. Demotix/Nikolas Georgiou. Some rights reserved. People tortured by police wearing hoods, immigrants with toddlers in their arms drowning in the sea, while the Port Authorities stand by and enjoy the spectacle, floodlit by the spotlights from their boats. It is in these terms that security is defined in modern day Greece and it is not the result of isolated decisions made by those serving in the Security Forces. The orders come directly from the political leadership in Greece of 2013. A file that HOT DOC has at its disposal reveals that tortures denounced by immigrants and denied by the Minister of Public Order, Nikos Dendias, are not only factually correct but were the result of order from the Head of ELAS himself, Nikos Papagiannopoulos. While Lieutenant General Papagiannopoulos was issuing the order ‘make their life unliveable’, the political leadership, along with the Prime Minister of the country, claim that the torture chambers they have set up are simply centres for the repatriation of illegal immigrants. In the last year 130 immigrants have drowned in the Aegean. Suddenly the Greeks seas have filled with corpses, even though for years immigrants have taken the same route to Greece. Why is it that more and more people who are trying to leave their country arrive dead in Greece? Why is it that the 5 or 6 immigrant deaths in previous years have now become 130? In many cases HOT DOC have received reports denouncing the Port Authorities for just standing by and watching them drown, having received orders not to intervene in order to create the image of a new harsh stance towards illegal immigration in Greece which will act as a deterrent for others who might try to enter the country illegally. Among the dead there are always children. The light from the Port Authority’s craft turns on and the crew watch them drown. Those who survive and make it to dry land are then tortured by hooded police, who plunder whatever they find. Gold, money, mobile phones are said to be the booty for those police officers who carry out ‘repatriation operations’. By citing such racist and illegal tactics so openly in favour of making life unliveable for those who are protected by international agreements signed by Greece, even though he is not talking to a close circle of officers but to a wider group, it is evident that the Head of Police has political backing and is carrying out political decisions. Nor is it coincidental that the Port Authorities use the same methods of torture against immigrants even though they are not under the administration of Nikos Papagiannopoulos. Clearly there is a common political agenda from which orders are being issued, including denial and cover up of any incidents of torture that come to light. Antonis Samaras is proud of the fact that he is implementing tactics that ‘until today were forbidden’, while he and his party systematically speak about ‘illegal immigrants’ and not just ‘immigrants’, creating the impression that it is foreign invaders and not immigrants who have left their homelands to escape danger to their lives. And he does this in a country that has sent immigrants all over the world and continues to do so. In October 2013, after his meeting with the Prime Minister of Malta, the Greek Prime Minister said, ‘In Greece there are as many unemployed as there are illegal immigrants and that cannot continue.’ He openly echoed what Le Pen, Nikos Michaloliakos and many other far right leaders in Europe have also mooted on occasion, that unemployment is a result of immigration. The fact that he is an accessory before the fact and of Nikos Dendias does not exonerate the Head of the Police from moral and penal responsibilities with regard to the torture of immigrants and encouraging his subordinates to commit illegal acts. It also goes without saying that a police force that functions outside the law and humanitarian prescripts, using violence as a tool, a police force using habitual violence will not restrict its violence to the bodies of immigrants, even if this torture is extended in the name of so-called righteousness. Sooner or later, they will find other villains or internal enemies to afflict.